Bradley Wiggins (Sky) has won the 2011 Critérium du Dauphiné overall, with Joaquin Rodriguez (Katusha) taking the final stage win atop La Toussuire on Sunday. It’s Wiggins’ – and team Sky’s – biggest road win to date and confirms that he is on great form ahead of the Tour de France in July. He is only the third British rider to win the Dauphiné, after Briain Robinson in 1961 and Robert Millar in 1990. Wiggins gained time on his rivals during the individual time trial on Wednesday and defended the yellow jersey the rest of the way with apparent ease. Rodriguez took his second stage win in two days, netting himself the points classification. Wiggins finished 10th on the stage to secure the overall victory ahead of Cadel Evans (BMC Racing) in second and Alexandre Vinkourov (Astana) in third. Thibaut Pinot (FDJ) launched a solo attack from an 11-man escape group on the ascent of the Col du Glandon before continuing alone to the hors categorie summit of Col de la Croix-de-Fer. On the fast descent, he was joined by a plummeting Thomas Voeckler (Europcar) and the two Frenchmen linked up to stretch their advantage over the chase group containing race leader Wiggins. Pinot struggled to keep up with Voeckler’s pace on the downhill and was dropped by his compatriot. Robert Gesink and Juan Manuel Garate (Rabobank) then attacked the Wiggins group toward the end of the descent, with Garate dropping Gesink off at the base of the day’s final climb, La Toussuire. Gesink then caught Pinot, and then the pair linked up with Voeckler. Behind, Rigoberto Uran was leading the chasers for his Sky team leader Wiggins. As the three escapees hit the 5km-to-go marker, Chris Anker Sorensen (Saxo Bank-Sungard) bridged up to join them. Sorensen won the last time the Dauphiné visited the climb in 2008 and immediately went to the front of the lead group. In the contenders group, it was up to Evans, Vinokourov, Rodriguez and Van Den Broeck to set the pace as Wiggins sat behind keeping an eye on the attacks. Rodriguez then attacked, passing the lagging lead quartet. Evans and Van Den Broeck followed Rodriguez. Wiggins didn’t panic, sitting in and getting back up to the attackers with a measured ride as the lead group came back together for the final kilometre. Rodriguez then rode away from the group with a huge attack. No one could follow his wheel as he took his second win in two days. Wiggins crossed the line in a small group 11 seconds behind Rodriguez, his work done and his arms aloft. Both Geraint Thomas (Sky) and Daniel Lloyd (Garmin-Cervelo), the other two Brits in the race, finished outside the time cut in a large group and were eliminated. Wiggins Dauphiné win has now established him as one of the strongest current stage racers. More than that, the performance of the Sky team as a whole was more cohesive than we have yet seen. Wiggins never looked isolated as his squad rallied around him. Edvald Boasson Hagen in particular was always in the mix, contesting time trials, bunch sprints and even Monday’s mountains stage. But for many, Boasson Hagen’s most memorable performance of the race was his mammoth pace-setting turn leading Wiggins up the final climb on the penultimate stage. 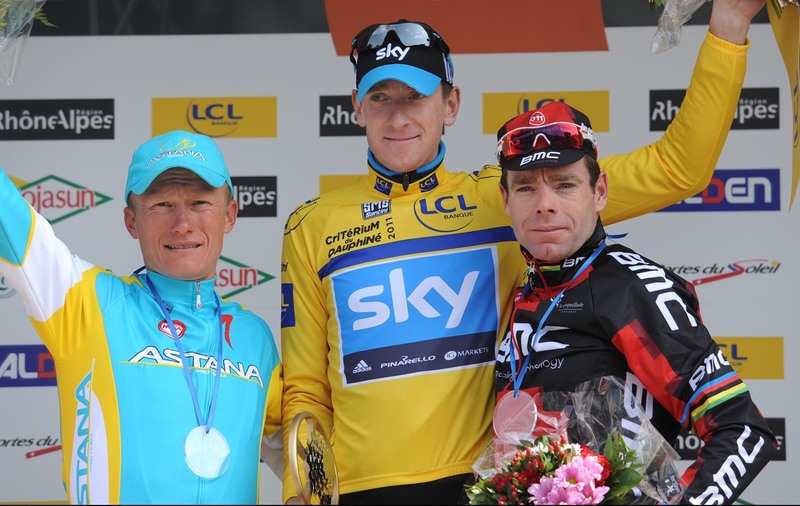 The importance of Wiggins’ win at the Dauphiné cannot be underestimated – for himself, Sky and for Great Britain. It is one of the toughest and highest-ranked races on the world calendar. His stage placings and overall win has netted a sizeable chunk of UCI ranking points which will assist Great Britain’s bid for a full-strength team at this year’s road race World Championships in Copenhagen, where Mark Cavendish will be bidding for the title. Wiggins now moves up to equal 10th with Sean Yates in Cycling Weekly’s all-time list of pro winners.